Cuckoo is the common name for the slender-bodied birds comprising the diverse avian family Cuculidae of the order Cuculiformes, characterized by long tails, down-curved bills, and generally a dull grayish-brown plumage, although some are brightly colored. The over 130 species in Cuculidae are widely distributed in temperate and tropical regions of both the Old World and New World, and are both arboreal (tree-dwelling) and terrestrial. In addition to species with the name cuckoo, the cuckoo family also includes the roadrunners, koels, malkohas, couas, coucals, and anis. The coucals and anis are sometimes separated as distinct families, the Centropodidae and Crotophagidae respectively. Quite a number of species of cuckoo, such as the well-known European cuckoo (Cuculus canorus), practice brood parasitism, laying eggs in the nests of other bird species for rearing. 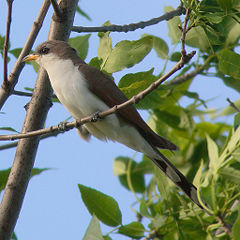 Such an instinctual behavior adds to the diversity and wonder of the animal world and has made the cuckoo a well-known bird, especially the unforgettable sight of a small parent bird feeding a very large cuckoo nestling—a nestling that may have ejected the parent bird's other eggs or nestlings from the nest. Cuckoos are birds of variable size with slender bodies, long tails, pointed wings, down-curved bills, and strong legs. The feet are zygodactyl: The two inner toes pointed forward and the two outer toes pointed backward. Cuckoos range in size from the little bronze cuckoo, at 17 grams (0.6 ounces) and 15 centimeters (6 inches), to the channel-billed cuckoo, at 630 grams (1.4 pounds) and 63 centimeters (25 inches). Most cuckoos reside in forests, but some prefer more open country. Most are insect eaters, with hairy caterpillars, which are avoided by many birds, being a specialty. The plumage typically is a dull grayish brown, but some, such as the bronze cuckoos—shining bronze-cuckoo (Chrysococcyx lucidus), Horsfield's bronze-cuckoo (Chrysococcyx basalis), and so forth—are brightly colored or iridescent. Cuckoo genera differ in the number of primary wing feathers as below. This reed warbler is raising the young of a common cuckoo, the best-known cuckoo. About 56 of the Old World species and 3 of the New World species are brood parasites, laying their eggs in the nests of other birds (Payne 2005). The best-known example is the European common cuckoo (Cuculus canorus). The cuckoo egg hatches earlier than the host's, and the cuckoo chick grows faster; in most cases, the chick evicts the eggs or young of the host species. The chick has no time to learn this behavior, so it must be an instinct passed on genetically. 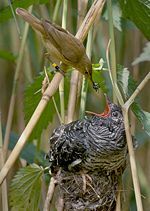 The mother still feeds the cuckoo chick as if it were her own, the chick's open mouth serving as a sign stimulus for the host to feed it (Campbell 1996). Different species and even populations of cuckoo select different host species, laying eggs that closely resemble the eggs of their chosen host. This also seems to have been aided by natural selection, as some birds are able to distinguish cuckoo eggs from their own, leading to those eggs least like the host's being thrown out of the nest (Campbell 1996). Parasitic female cuckoos are grouped into gentes (singular "gens"), that is, populations favoring a particular host species' nest, with each gens laying eggs that match those of the host species in color and pattern. Brood parasites, such as cuckoos, which use multiple host species to raise their chicks, evolve different gentes, each one specific to its host species. This specialization allows the parasites to lay eggs that mimic those of their hosts, which in turn reduces the chances of the eggs being rejected by the hosts. There is some evidence that the gentes are genetically different from one another. The majority of cuckoo species, including malkohas, couas, coucals, and roadrunners, and most other American cuckoos, build their own nests. Most of these species nest in trees or bushes, but the coucals lay their eggs in nests on the ground or in low shrubs. Though on some occasions non-parasitic cuckoos parasitize other species, the parent still helps feed the chick. Most of the nest-building cuckoos are monogamous, but the anis and the guira cuckoo lay their eggs in communal nests. Their behavior is not completely cooperative; a female may remove others' eggs when laying hers (Payne 2005). Non-parasitic cuckoos, like most other non-passerines, lay white eggs, but many of the parasitic species lay colored eggs to match those of their passerine hosts. The young of all species are altricial (newly hatched young are relatively immobile, have closed eyes, lack feathers, and must be cared for by the adults). Non-parasitic cuckoos leave the nest before they can fly, and some New World species have the shortest incubation periods among birds (Payne 2005). Unlike most cuckoos, the Asian koel is mostly frugiverous. Most cuckoos are insectivorous, and in particular are specialized in eating larger insects and caterpillars, including noxious hairy types avoided by other birds. They are unusual among birds in the way they process their prey prior to swallowing, rubbing it back and forth on hard objects such as branches and then crushing it with special bony plates in the back of the mouth (Kaiser 2007). They also will take a wide range of other insects and animal prey. The lizard-cuckoos of the Caribbean have, in the relative absence of birds of prey, specialized in taking lizards. Larger, ground types such as coucals and roadrunners also feed variously on snakes, lizards, small rodents, and other birds, which they bludgeon with their strong bills. Several koels, couas, and the channel-billed cuckoo feed mainly on fruit (Corlett and Ping 1995), but they are not exclusively frugivores. 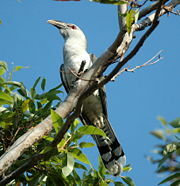 The parasitic koels and channel-billed cuckoo in particular consume mainly fruit when raised by fruigivore hosts such as the figbird and pied currawong. Other species will occasionally take fruit as well. The African cuckoo was identified as a separate species on the basis of its call. Cuckoos are often highly secretive and in many cases best known for their wide repertoire of calls. Calls are usually relatively simple, resembling whistles, flutes, or hiccups (Brooke and Horsfall 2003. The cuckoo family gets its English and scientific names from the familiar, two-note call of the common cuckoo, which is also familiar from cuckoo clocks. Some of the names of other species and genera are also derived from their calls, for example the koels of Asia and Australasia. In most cuckoos, the calls are distinctive to particular species, and are useful for identification. Several cryptic species have been identified on the basis of their calls. Although cuckoos are diurnal, many species call at night (Payne 2005). The near passerine bird order Cuculiformes has traditionally included three families: Cuculidae (cuckoos), Musophagidae (turacos and allies), and Opisthocomidae (hoatzin). However, the taxonomy of this group is now controversial. The Sibley-Ahlquist taxonomy raises the Musophagidae to an order Musophagiformes, which may or may not be warranted. The hoatzin continues to be enigmatic; it is probably best regarded as a distinct, monotypic order, especially if the turacos are also considered one. The coucals and anis are sometimes considered subfamilies of the Cuculidae, or otherwise assigned to families of their own, the Centropodidae and Crotophagidae respectively. The following is the systematics of the family Cuculidae including coucals and anis as subfamilies within this taxon. Brooke, M. de L., and J.A. Horsfall. 2003. Cuckoos. In C. Perrins (ed. ), Firefly Encyclopedia of Birds. Firefly Books. ISBN 1552977773. Campbell, N.A. 1996. Biology, 4th edition. Benjamin Cummings. ISBN 0805319573. Corlett, R., and I. Ping. 1995. Frugivory by koels in Hong Kong. Memoirs of the Hong Kong Natural History Society 20: 221-222. Feduccia, A. 1996. The Origin and Evolution of Birds. New Haven: Yale University Press. ISBN 0300064608. Kaiser, G.W. 2007. The Inner Bird; Anatomy and Evolution. Vancouver, BC: UBC Press. ISBN 9780774813433. Olson, S.L. 1985. Section VII.C. Cuculidae. In D. S. Farner, J. R. King, and K. C. Parkes (eds. ), Avian Biology 8: 110-111. Payne, R.B. 2005. The Cuckoos. Oxford University Press. ISBN 0198502133. This page was last modified on 5 November 2008, at 18:58.